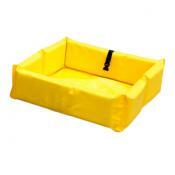 Portable & compact spill containment berms for convenient quick response. 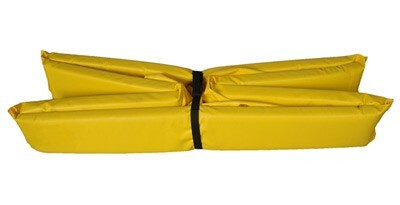 Portable spill containment berm quickly deploys for use indoors or outdoors. Compact and lightweight to store in truck cabs, emergency vehicles, and spill kits. Folds and secures in seconds, with attached strap and clip, for easy transport. Heavy-duty, leak-proof PVC fabric offers excellent chemical resistance. Resists acids, gasoline, diesel fuel, antifreeze, caustics and corrosives. Ideal secondary containment for vehicle maintenance, drips, or IBC/drum storage pad. Sturdy but soft 2"w x 6"h foam sidewalls can be stepped on and driven over. Bright yellow PVC provides high visibility to safely minimize trip hazards. Available in three sizes with up to 75 gallon sump capacity. Mini Foam Wall Containment Berms are a lightweight and convenient fast-response solution for leaks and spill control. Also known as Duck Ponds, this portable containment system features six inch high collapsible walls made of closed-cell foam sealed with PVC material. They require no assembly or ground pad and quickly deploy for spill prevention under vehicles or other equipment. The containment berms quickly clean and pack down for easy storage in vehicles or safety cabinets. These units do not require a separate carrying case—the foam containment walls accordion fold and quickly secure with the built-in strap and clip. They are lightweight for easy transport yet heavy-duty enough to withstand continual re-use. Suitable for indoor and outdoor applications, a Mini Foam Wall Containment Berm is the perfect addition to any workplace spill kit. Made in the USA with heavy-duty 18oz PVC, this portable spill containment solution provides excellent chemical resistance. The impermeable PVC material is leak-proof, easy to clean, and built to withstand repeated use. The units are ready to store after cleaning and removal of oil, grease, and other hazardous materials. The sturdy and straight foam sides are two inches wide and 6 inches high. Unlike pop up pools, the foam compresses to easily accommodate vehicle and foot traffic passing across. The soft side walls of these collapsible berms will immediately spring back into shape to reliably contain liquids. The single piece design never requires costly replacement parts, unlike l-bracket and other bracket berm designs. Repair kits are available to address punctures or other damage. These foldable containment berms are compact, lightweight, and easy to move or store yet ready deploy in a moment’s notice. Our smallest 2' x 2' portable spill containment berm weighs only 3 pounds and has a 15 gallon capacity. 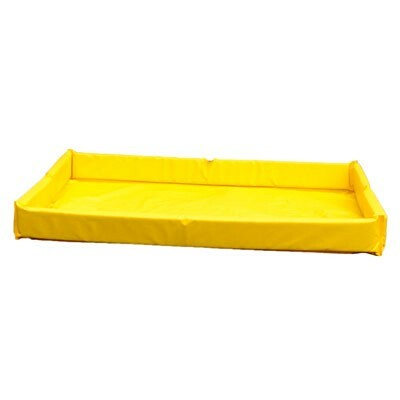 The largest 4' x 6' spill berm is a lightweight 9lbs with up to 75 gallons spill control capacity. The low profile walls are six inches high allowing them to quickly pass underneath vehicles or mechanical equipment for fast spill containment. The collapsible berm is a one-piece design of durable PVC. The unit does not have or require drain plugs. 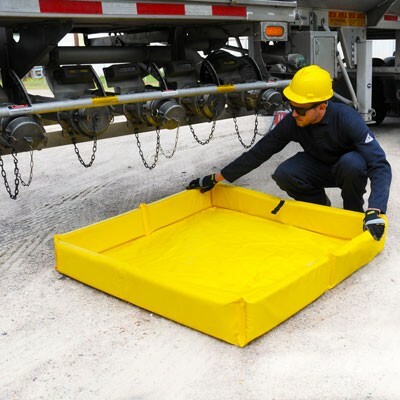 Extremely lightweight and portable, these spill berms quickly deploy for spill response situations. Their foam sides accordion fold down for compact stowing and do not require a carrying case. Simply use the built-in strap to wrap, clip, secure and store after use. An ideal grab and go spill solution, keep them in the back of vehicles, truck cabs, or place inside workplace storage cabinets for fast response. The high visibility color is easy to identify and helps minimize tripping hazards. Our spill containment portable systems are ideal for secondary containment during maintenance activities inside your warehouse or workplace facility. Easily place them under vehicles or equipment to collect fluids. The soft foam sides allow vehicles and other wheel or foot traffic to pass over and position equipment. The walls snap back into shape so no ramps or drum lifters are necessary. They are also suitable for outdoor use in the field as an emergency response to unexpected leaks from trucks or other machinery. The largest berm is a practical solution for equipment wash down stations. They prevent unwanted discharge into soil or storm drains for EPA compliance. We recommend using a tarp or ground pad underneath the berm to prevent punctures in rough ground or uneven terrain. This spill containment product can be used inside or outdoors to help meet SPCC and EPA regulations. The leak-proof PVC is suitable for spill prevention to contain water, oils, grease, gasoline, battery leaks and more. The small footprint of our 2'x2' and 4'x4' collapsible berms make a great containment pool for maintenance activities. Use them in fluid changing areas or as a track pan drip tray to capture leaks under vehicles, trucks or other machinery. Use the largest 4'x6' spill containment pool with IBC pump kits, or, place under valves when transferring liquids between tanks to mitigate potential oil spills. They make a versatile alternative to spill pallets or spill decks for temporary storage of 55-gallon drums, safety cans, and other tank containment. Placing a deck grate inside the berm may be helpful to elevate drums. 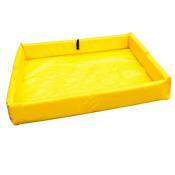 Portable Foam Wall Containment Berm with 18 oz yellow PVC material covering. See our PVC Chemical Compatibility Guide for more information. 40 CFR 263.30(a), 40 CFR 264.175. Please contact us by email or call toll free (800) 869-9633 for any product order or shipping questions. Mini Foam Wall Containment Berm - Dimensions: 2 feet wide x 2 feet long x 6 inches high. Wall thickness 2 inches. Material: 18 oz PVC. Color: Yellow. Capacity: 15 gallons. Weight 3 lbs. 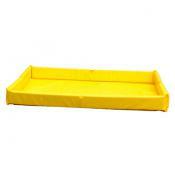 Mini Foam Wall Containment Berm - Dimensions: 4 feet wide x 4 feet long x 6 inches high. Wall thickness 2 inches. Material: 18 oz PVC. Color: Yellow. Capacity: 60 gallons. Weight 7 lbs. Mini Foam Wall Containment Berm - Dimensions: 4 feet wide x 6 feet long x 6 inches high. Wall thickness 2 inches. Material: 18 oz PVC. Color: Yellow. Capacity: 75 gallons. Weight 9 lbs.